ACT has been a dealer for LIFT-A-LOFT for 43 years. Lift-A-Loft makes vertical mast aerial lifts designed to operate in narrow aisles and congested plant environments. These self-propelled aerial lift platforms offer a combination of high lift, reach, and maneuverability that make them a safe solution for tough industrial applications. When floor space is at a premium, it is more important than ever to have vertical mast lifts that can fit in tight areas and provide up and over reach. These aerial lifts can be used for facilities maintenance, work process or work positioning applications. Vertical mast aerial lifts are known for their versatility, stability and durability. Operators feel comfortable working when they are able to access hard to reach areas that other products cannot accommodate. This is why thousands of industrial manufacturing facilities around the world depend on Lift-A-Loft lifts on a daily basis. 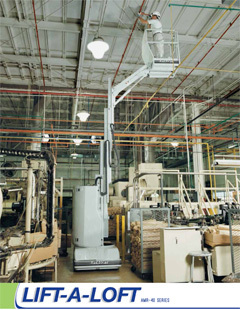 Lift-A-Loft also supplies custom solutions for industrial customers with unique or unusual needs. Special units are built by adding features and tools to lifting systems to improve efficiency and safety for a given application. Lift-A-Loft can also offer certain material handling and order picking solutions or design products from the ground up to solve a particular application requirement. With an onsite assessment, recommendations can be made for the proper solution. Options include sale, lease, rental, as well as rebuild of existing units. Does your company get the annual ANSI required inspection for aerial work platform equipment? ACT offers complete service and safety training for aerial work platforms, so solutions come in and a variety of ways. Up, up, and away, but do it safely! Get pressure washing and industrial cleaning services in Edmonton, Nisku, Fort Saskatchewan and surrounding areas. If you need any assistance give us a call today at 780-224-8610.